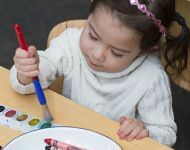 Let your child discover ways to express his or her creativity through winter and holiday themed crafts. Recommended for ages 2-6 years old. Play clothes suggested.